Aab is a UK-based company that was started back in 2007, who focus on providing everyday, work wear and occasion abayas. They design and manufacture their own products with a focus on quality and ethical production. Aab have recently revamped their website and launched their Autumn/Winter 2012 collection, which features design elements inspired by runway styles. I was sent a few items from the collection to review, including the Winter Warmers Abaya, Gold Dust Abaya, Autumn Falls Silk Hijab, Burning Embers Chiffon Silk Hijab, and Pearl Drops hijab pin. The Gold Dust abaya is made from a beautiful black silk with a patterned fabric on the bodice and cuffs. It is very lightweight and sheer, so comes with a full length, sleeveless black slip to wear underneath. The abaya is very loose from the shoulders downwards, but the sleeves are quite tight, particularly around the elbow and forearms. The neckline opens quite low down, and since you already need to wear a slip, this does make it difficult to wear another layer such as a t-shirt underneath. For an occasion abaya, the design is very elegant but subtle, and you can easily dress this up with gold or silver accessories. 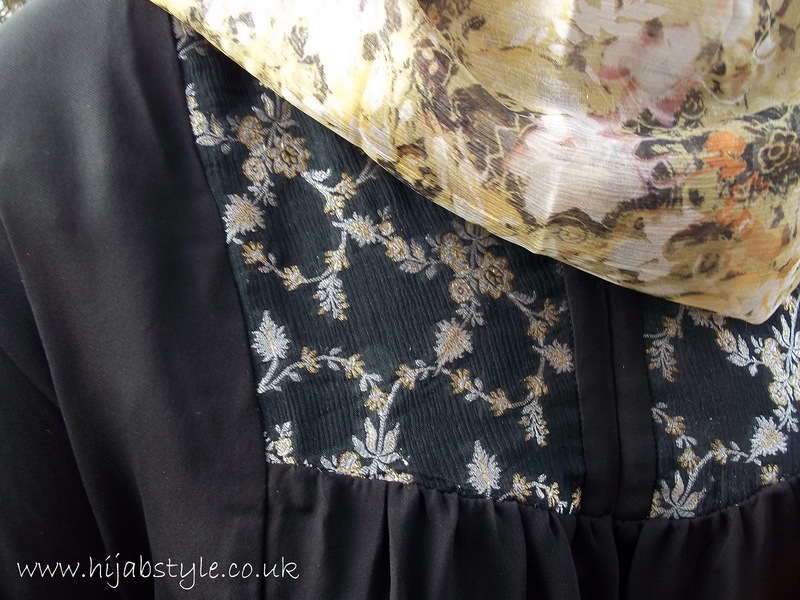 My favourite thing about the abaya is definitely the fabric, it's incredibly smooth and lightweight, and would probably be quite comfortable in hotter weather. 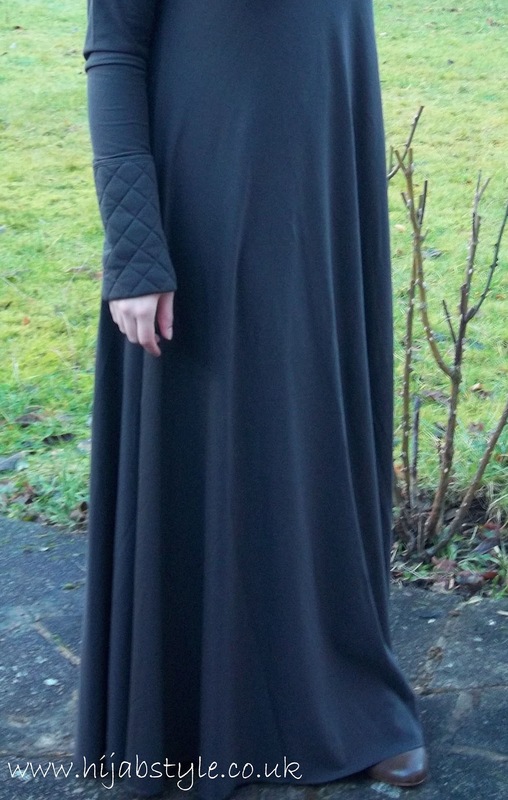 Winter Warmers is a deep brown, cotton jersey abaya with a quilted collar and cuffs. The abaya has a flattering fit when worn, and flares out at the waist. The neckline is again quite open. It's also really comfortable to wear and easy to move around in. I did find however that the sleeves and top half were very tight, as if you were wearing a long sleeved top for layering. You can't really wear anything more than a short-sleeved t-shirt underneath the abaya without it bunching up. 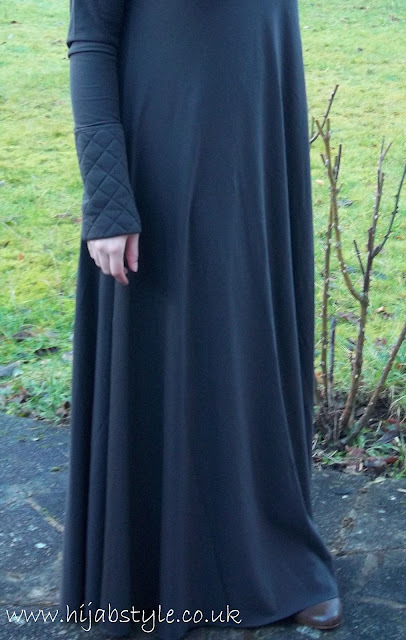 For a winter abaya this is a bit strange, since you may want to wear a jacket or cardigan over the top, which isn't easy as the quilted cuffs are quite thick. Winter Warmers makes a great everyday abaya and I'd pair it with brown or tan boots and and patterned scarf like the Autumn Falls hijab below. All the abayas now come in a range of lengths, saving you the trouble of getting things adjusted. 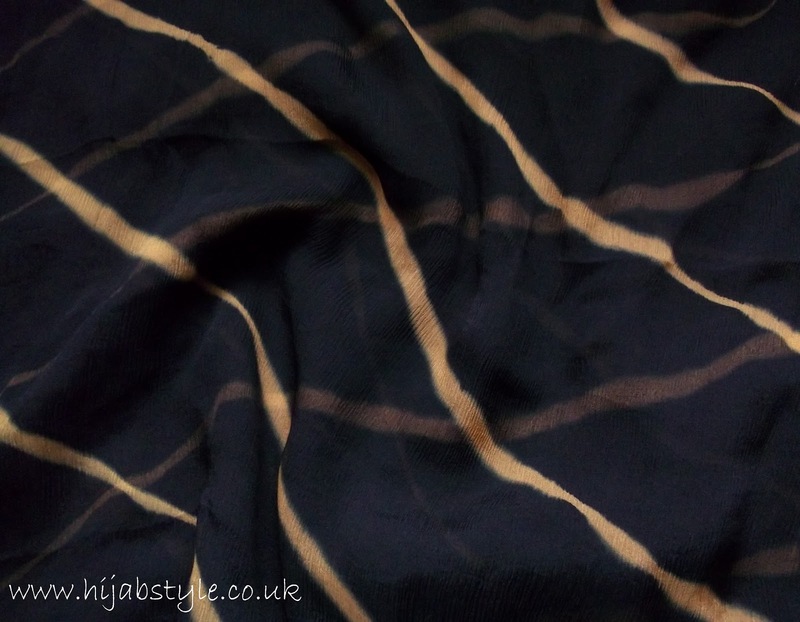 The Autumn Falls Silk Hijab is definitely my favourite scarf on the Aab website right now. It's made from two layers of delicate silk chiffon sewn together and measures 200cm x 60cm. The print is a beautiful mix of flowers and foliage, and works well with a variety of colours. 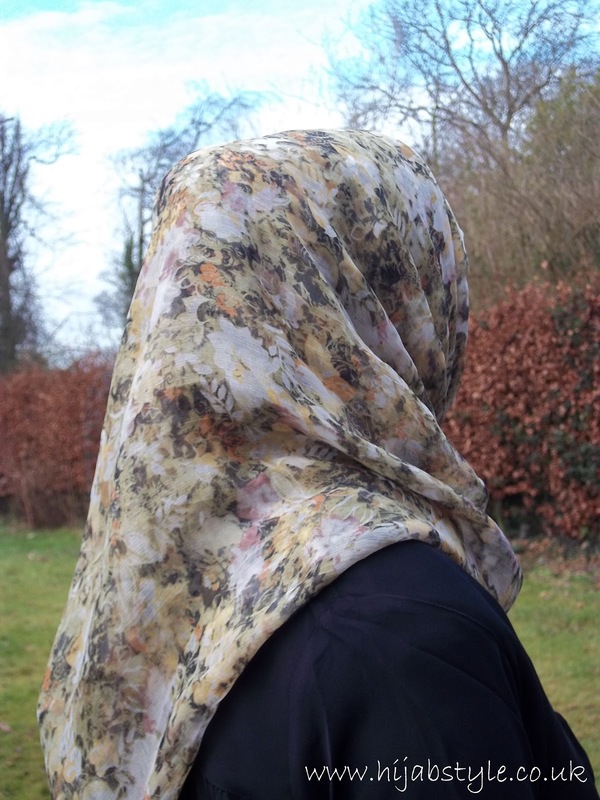 The Burning Embers Chiffon Silk Hijab is part of a range of hand-dyed chiffon hijabs. The fabric is very sheer so needs to be worn folded over, but you can do this easily as the hijab measures approximately 200cm x 125cm. The fabric has a slightly rough texture, so the hijab won't slip around when worn. Personally I found the print too dark for my liking, but it does go well with plain black abayas. 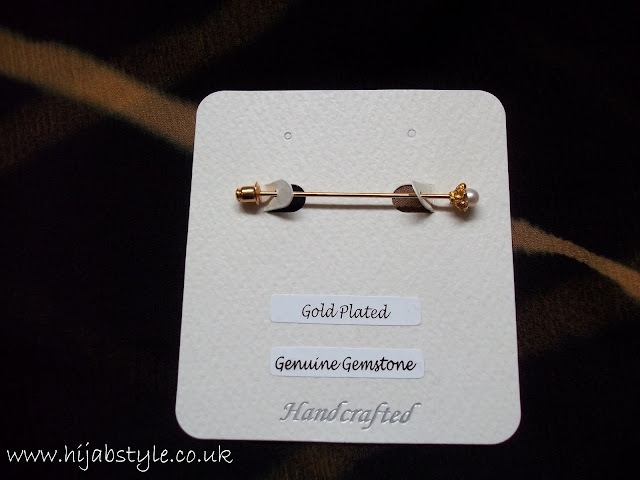 Finally, the Pearl Drops hijab pin a simple gold plated stick pin with a flower design and pearl at the centre. It's very small and elegant and is perfect to use on an everyday basis. Overall I think the abayas are well-made and different from the usual offerings on the market. 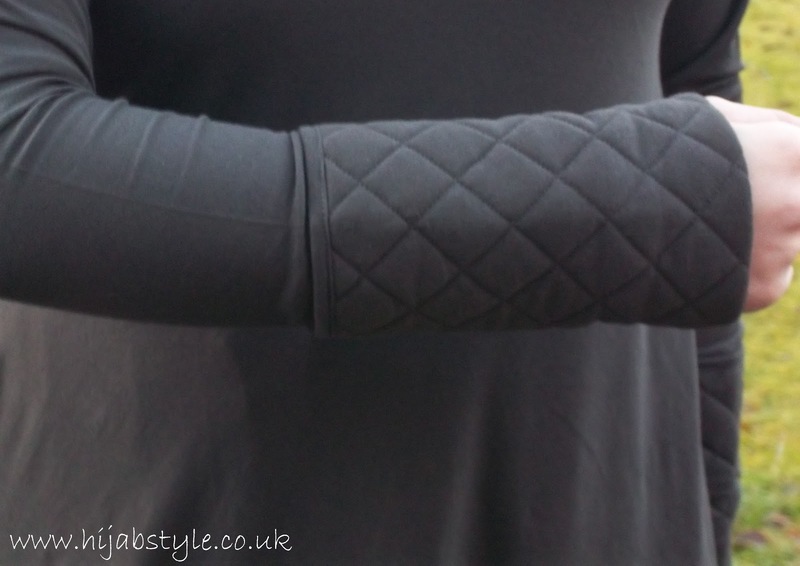 However I think the cuts need to be improved to include looser sleeves to make allowances for women who want to wear long sleeve tops underneath their abayas, especially in the winter. Or maybe two sleeve options, fitted and loose? That would be a great improvement, to have sleeve options. I must agree the sleeves are too narrow, love the designs have been a customer for years however seems like they skimping on fabric lately.